The first Global Bamboo and Rattan Congress, BARC 2018, opened on 25th June 2018, in Beijing, China. Although it is already two months ago, I want to use this moment to reflect on BARC 2018, as it consumed most of my time during the first half of the year. The three-day event, co-hosted by the International Bamboo and Rattan Organisation (INBAR) and China’s National Grassland and Forestry Administration, welcomed (many) more than 1200 participants from 70 countries, including Ministers, policymakers and representatives from research institutes, development organisations, UN bodies and the private sector. Over the course of three days, participants could choose to attend a ministerial summit, three high-level dialogues – which covered South-South cooperation, climate change, and innovation and industry development – and around 80 parallel sessions. The overarching theme of the Congress was “Enhancing South-South Cooperation for Green Development through Bamboo and Rattan’s Contribution to the Sustainable Development Goals”. Overall, BARC 2018 was a great success. Bamboo and rattan are critical resources, but still grossly under-used. Fast-growing and local to some of the poorest communities in the tropics and subtropics, bamboo and rattan are used around the world in simple construction and as household utensils, but BARC 2018 illustrated that they could provide much more. Discussions included how to realise bamboo and rattan’s huge potential in a number of areas: sustainable commodity production, disaster-resilient construction, poverty alleviation, climate change mitigation and adaptation, land restoration and biodiversity protection. I was very happy that BARC 2018 was not a stand-alone activity, but it followed the INBAR Strategy 2015 – 2030. The strategy has four components: Policy advice, membership and partnership, information and technology sharing, and real action on the ground. In my view, BARC 2018 supported these four objectives. With regards to policy advice, we managed to raise the profile, especially amongst a new group of stakeholders. Our aim is to help members to achieve their Sustainable Development Goals, and that means reaching out beyond the world of forestry and foresters. BARC 2018 involved many participants who were not “bamboo or rattan specialists”, and we managed to show new partners what amazing opportunities bamboo can provide. This will directly and indirectly influence policy. For example, we worked with UN Women to highlight the gender aspects of bamboo and rattan; we had key-note speakers from UN Conventions and the International Fund for Agricultural Development (IFAD) who had not heard of INBAR before they joined us; we listened to parliamentarians from Ethiopia, Philippines and Uganda; we learned from global thinkers from the Club of Rome like Gunter Pauli, Fred Dubee and Jinfeng Zhou. The opening of BARC 2018 included congratulatory messages from Heads of State from China, Colombia and Ecuador, and from the UNDP Administrator Achim Steiner and the Director-Deneral of FAO Graziano da Silva. The Congress also launched the Beijing Declaration, which recognizes bamboo and rattan’s various benefits, and commits “ministers, senior officials and participants” to calling upon national governments and other bodies to implement a number of recommendations. With regards to membership support, we used this Congress very effectively for South-South Cooperation, and all our members were very happy to share their experiences and learn from each other. We even announced a new INBAR Member – Central Africa Republic. We must have had several hundred representatives from our Member states all over the world, and in that respect BARC 2018 was a real membership-driven event. The participants included Ministers and Vice-Ministers, senior civil servants and a whole range of technical and administrative officers. I had bilateral meetings with several of the delegations, and most of the policy-makers had a speaking role in one of the plenaries or in parallel sessions. One particular aspect that was particularly important was the opportunity to learn from China. China has such a lot to offer, but most of the information is not readily available outside of the borders. BARC was an opportunity to learn from the experiences from China, to talk with Chinese practitioners, to see Chinese products and to make contacts for future participation. One publication that was extremely valuable is the “Yellow Pages” of bamboo and rattan in China, listing just about every bamboo or rattan enterprise in the country. Third, The Congress was a major tool to share information and innovation. We had fantastic presentations, and learned the latest developments from inside and outside of China. This included the bamboo fibre winding technology in China, but also the manufacturing of telegraph poles from bamboo in Kenya, the latest research on glues and adhesives from Australia and Ecuador and presentations about design and product development. Prof. Mme Jiang Zehui reflected on the history of bamboo research in China, and John Hardy told us about the amazing bamboo constructions in the Green School in Bali. We also had an exhibition with amazing products, and a real eye-opener for newcomers. The “piece de resistance” for me was the blade of a wind turbine, manufactured from bamboo fibre by Tsinghua University Science Park, but we had lots of other beautiful products. We launched INBAR-FAO-NEPAD report about bamboo for landscape restoration; we published a report about rattan terminology, prepared by the INBAR Task for on Rattan; we announced a report about subsidies for bamboo afforestation in China that was written by Zhejiang Agriculture and Forestry University; together with Delft University, we published a report about carbon storage in bamboo and we distributed the English translation of the China National Bamboo Plan 2011-2020. We also distributed “Booming Bamboo”, written by Pablo van der Lugt. This is an up-to-date review of what you can do with bamboo. Finally, we made very practical, concrete decisions to support real action. We signed agreements, had a political declaration, made new partnerships. It really was not just a talk-shop, but we build the foundations for a lot of new future work. The most important agreement that we launched was a contract with IFAD Rome to start a new intra-Africa bamboo livelihoods programme, involving Ethiopia, Cameroon, Ghana and Madagascar. I was very happy to sign this agreement with the IFAD Associate Vice-President Charlotte Salford. Other specific outcomes include a commitment from the Netherlands government to support the next phase of the Sino-Dutch bamboo project in East Africa with USD 2 million. We reached a tentative agreement to hold a 2019 planning workshop in China for Giant Panda conservation and bamboo habitat management. IFAD also confirmed financial support for a bamboo project in Colombia, Ecuador and Peru. Together with several partners we agreed to the creation of a global network of bamboo training facilities, and with FAO and potential recipient countries we discussed a large global “bamboo for climate change” project that will be submitted to GEF. We signed partnership agreement with several organisations, including the International Tropical timber Organisation (ITTO), the Forum for Agricultural Research in Africa (FARA) and the Gaborone Declaration for Sustainability in Africa (GDSA). Organising an event is mainly a logistics activity, and an event is only useful if it provides impact and it makes a difference. There is no point in doing great things if we cannot share the lessons learned, and I believe that BARC 2018 was one of the most important communications tools that INBAR had at its disposal in 2018. I was therefore thrilled that we had a lot of coverage, both in Chinese media and in international press. We had hundreds of Chinese media reports, including Xinhua, China Daily, and Chinese video channels CGTN and CCTV, as well as local media from BARC strategic partners Yong’an, Meishan and Yibin. There is a lot of information on the INBAR website as well. This includes general stories about BARC 2018 as well as specific reports or interviews. And we have hundreds of photos. One of the young interns that helped me during BARC 2018, is now working with us to catalogue all the videos, presentations, speeches and other written products of the Congress. A mammoth task. Talking about interns – we had a large number of super volunteers at the Congress, and I was happy to recognise them by given a token of appreciation to one representative. Late last week, I returned from Ordos in Inner Mongolia, where I attended the High-Level Segment of the UNCCD COP13. It was a busy three days, and I had a number of meetings and events to attend. I travelled to Ordos from Beijing together with INBAR Director of Host Country Communications Dr Wu Junqi and INBAR Global Policy Officer Dan Mejia. The first day started with the official opening by Vice-Premier Wang Yang, and keynote speeches by the UNCCD Secretary-General Monique Barbut and State Forestry Administrator Zhang Jianlong. INBAR is official Observer to the Convention, so we had our spot amongst the other Inter-Governmental Organisations. The first day ended with a spectacular meal for VIPs to the COP, and I was very happy to meet the representative from Haiti during dinner. We talked a lot about the help that bamboo could bring to poor, unemployed youth in Haiti, but creating a source of material for construction, design and other uses. INBAR had a booth in the exhibition hall, to make publicity about INBAR, and in particular about the global Bamboo and Rattan Congress that we are organizing in June next year (BARC2018). Nura Demuyakor and Michelle Liu had arrived earlier in the week, and Dr Li Zhiyong, Deputy Director-General joined me the following day. The booth turned out to be an excellent venue for bilateral meetings, and a good place to sit and check email correspondence. It attracted good deal of attention, and we shared many brochures and gave lots of information about bamboo, rattan, INBAR and BARC2018. We used the booth to good effect. I talked with the Director of Forestry of Togo about the interest to develop joint action. Togo has both bamboo and rattan resources, but we know little about the available natural capital, or about the potential value chains that we can develop in the country. We agreed that a rapid appraisal would be very useful, and I offered INBAR help to make such an assessment. I briefly talked to the Director of Forestry of the Comoros, and stressed the point that we can help with the development of a bamboo charcoal industry. Comoros Ambassador Mahmoud Aboud has told me in the past that the Comoros imports charcoal from Thailand, and I explained to the Director of Forestry that Comoros could produce its own charcoal from bamboo. We met with the delegation from COMIFAC, the Central African Forestry Commission, and talked about cooperation. COMIFAC represents 10 countries in the Congo Basin of Central Africa, and aims at sustainable forest management. The Executive Secretary, Mr Ndomba Ngoye, is keen to forge a partnership with INBAR and we talked about the possibility to launch a Memorandum of Understanding between both organisations during BARC2018. The Executive Secretary will also reflect on the possibility for COMIFAC to join INBAR as a Regional IGO. We talked with Senator Heloo from Ghana, who used to be the Deputy Minister for Environment. She is keen to develop her small charcoal manufacturing enterprise into a larger industry, and wanted to know if INBAR has experience to help her. I offered to put her in contact with our Regional Office in Kumasi, Ghana, as they have given training courses in this field. Later, we met with the official delegation from the Ministry of Environment, Science, Technology and Innovation of Ghana, led by Hon Patricia Appiagyei, the Deputy Minister. We talked about Ghana’s Sustainable Land Managemnt programme, and the role of bamboo. Hon Appiagyei confirmed that Ghana has pledged to re-forest 2 million hectares, and a lot of this will be done with bamboo. We briefed her about the 20th Anniversary of INBAR in November this year, and the BARC2018 in June next year. I asked about the location of the office in Kumasi, and whether we should try to move to Accra. The Minister agreed that it would be easier to maintain active communication if we were in Accra, but she informed me that the Government is keen to decentralize responsibilities away from the Capital. Maybe Kumasi is not such a bad location after all. We had a long, and very constructive discussion with Zimbabwe Forestry Commissioner Abedinigo Marufu and his team about bamboo in Zimbabwe, potential membership of INBAR and the keen interest from Zimbabwe to develop a bamboo industry. They were asking for advice on propagation and tissue culture, and on effective methodologies for managing bamboo plantations. We explained that INBAR Membership is a pre-requisite for a real partnership, but that we can accept Zimbabwe as Observer, if they send a letter of intent. Mr Marufu thought it would be possible to sort this out before BARC2018, and he asked for more detailed information. We also met the new Ambassador for Climate Change of Canada, Ms Jennifer Macintyre, and talked about bamboo and climate change. Canada is a founding member of INBAR, and we talked about the fact that IDRC Canada helped to establish the organization. I thanked her for the recent letter from Minister McKenna, that guaranteed support for INBAR from Canada for the coming five years. We talked about possibilities of expanding and strengthening the relationship between Canada and INBAR, and Ambassador Macintyre advised me to contact people in Ottawa with concrete suggestions for collaboration, within the context of South-South Cooperation, and gender-based development. In the corridors, I met several old friends and colleagues, and I had a constructive lunch-time meeting with the UNCCD Global Mechanism. We discussed and agreed that bamboo could play an important role as indicator for Land Degradation Neutrality Targets of countries in the Global South. This is an issue we need to follow up, as it could be a significant means of support for our members. I also had a very useful meeting with Madagascar Minister for Environment, Ecology and Forests, Dr Johanita Ndahimananjara and her team. We are working in Madagascar on bamboo for livelihood improvement with financial support from IFAD, and hope to continue our engagement with a new IFAD grant. In addition, we have submitted a separate proposal for bamboo and land restoration to the Global Environment Facility (GEF), through the UN Environment Organisation UNEP. I also briefed Dr Johanita on our discussions with the French Development Agency (AFD) and the fact that they seem to be interested in working with INBAR on Madagascar. We talked about the presence of Madagascar at BARC 2018, and I invited the minister to join us next year from 25 to 27 June. She explained that this is impossible, as Madagascar National Day falls on 26 June, and she has to be in the Capital for the celebrations. But, she will send one of her technical staff, and she advised that we contact Ambassador Sikonina in Beijing. My last bilateral meeting in Ordos was with Hon Maria Victoria Chiriboga, Undersecretary of Climate Change in the Ministry of Environment of Ecuador. We talked about the fact that the INBAR Regional Office for Latin America and the Caribbean is in Quito, and Undersecretary Chiriboga is in close contact with our Regional Coordinator Pablo Jacome. She explained that Ecuador is pursuing a bio-economy, and that the new Government is looking for good examples and easy wins. She is convinced that bamboo can help, and wanted to know more about the use of bamboo for construction, pulp and paper, textiles and land restoration. I explained what INBAR has done and is doing, and agreed to provide further information through emails. We also talked about BARC 2018, and I invited Undersecretary Chiriboga to join us in Beijing next June. I explained that we hope to launch a new trilateral project between Colombia, Ecuador and Peru, with support from IFAD, and we would want senior representatives from each country to join us. Apart from the meetings, I attended the High-Level round table: Land degradation neutrality: “From targets to action…what will it take?”, but unfortunately INBAR did not get the opportunity to speak. So many government representatives wanted to present their case, that the Chair had to end the session before everyone had had the chance to talk. My case would have been to stress that bamboo offers a sustainable solution to help countries control erosion and reverse environmental degradation. Bamboos are arguably the fastest-growing plants in the world, and they are natural vegetation in most of the tropical belt throughout the world. Most bamboo species form an evergreen canopy, dropping leaves throughout the year and providing a perennial source of nutrients, and bamboo plantations are an important carbon sink. INBAR also organized a side event, together with FAO and the government of Ethiopia. The time was not very good, as we started at 8 am, but this was the only slot available. In the end, more than 50 participants attended the event, which was not bad considering the time. We had presentations from FAO in Rome and the China State Forestry Administration (SFA), and we had a representative from the Ministry of Agriculture of Ethiopia, the vice Minister for Environment of Ghana and the Secretary of State for Environment of Ecuador. They gave very interesting lectures, with amazing facts and figures. All of the countries are using bamboo in their work, and I was impressed with some of the ongoing activities. All-in-all, a very productive time in Ordos! 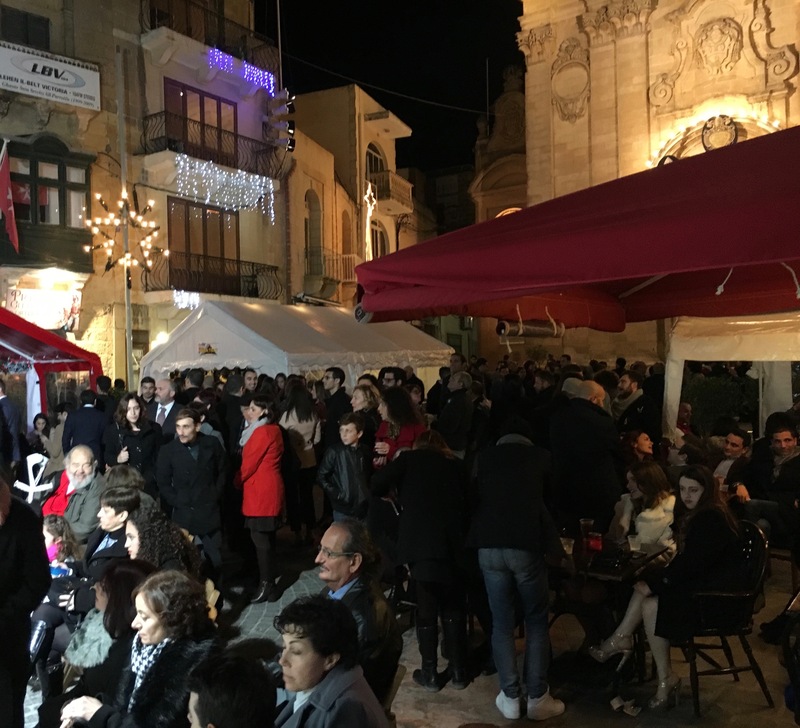 I spent the Christmas and New Year’s holiday on the island of Gozo, which is part of Malta. The weather was generally nice, and the island was quiet, compared to the summer when I normally visit. The Gozitans know how to celebrate Christmas and New Year, with concerts and performances in the squares and in the churches. Gozo is a dry island, and there are not many trees. I was surprised to read in the local Museum that in the past the island was covered in woodland, which was cut for construction and fuel. You would not believe that, as currently the main woody vegetation is made up of olive and fig trees. 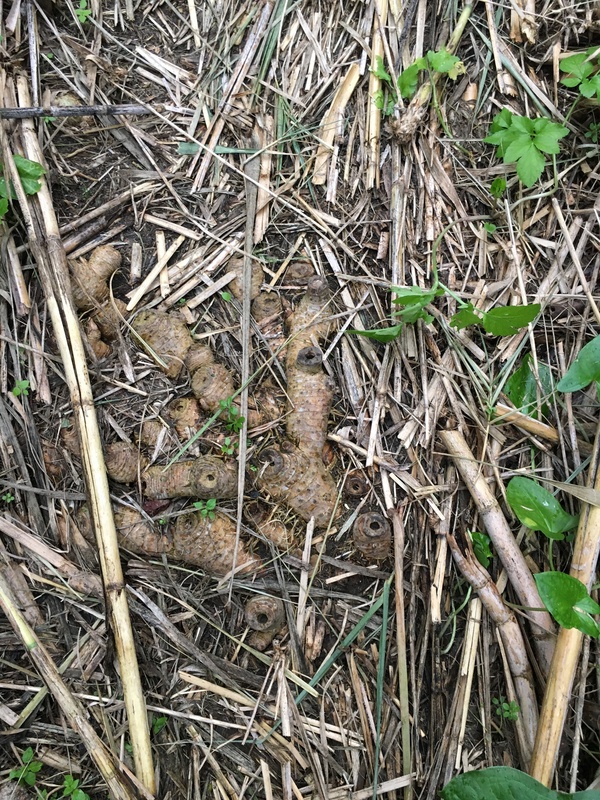 I also noticed that many of the dry valleys on the island have clumps of reeds that look remarkably like bamboos from a distance, and the local farmers call them canes. This year, I walked up the dry valley in Mgarr-I-Xini, and I found myself in a forest of these canes. The stems have nodes and the roots have rhizomes, just like the bamboos that we see in many parts of the Global south. But the leaves clearly show that they are not real bamboo species, and I therefore took this opportunity to learn more about these plants. 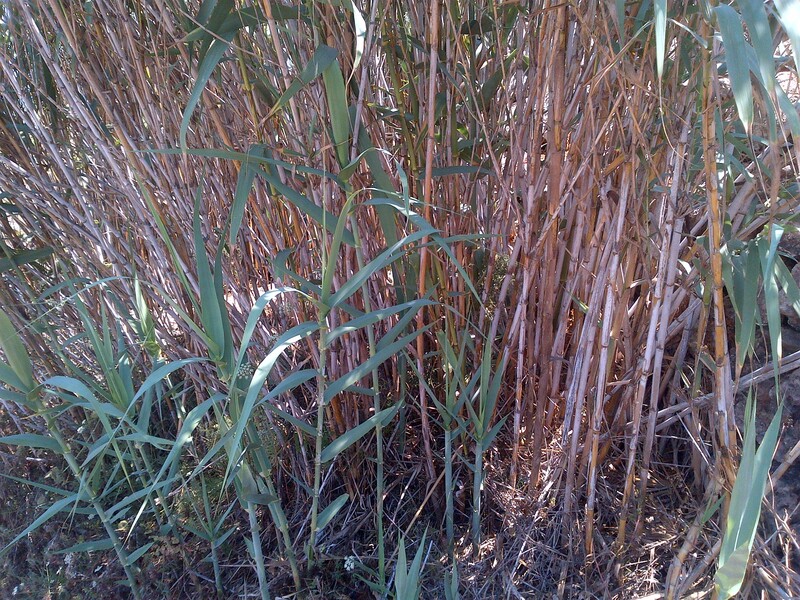 Wikipedia tells me that these reeds are Arundo donax, or giant cane. Other common names apparently include Spanish cane, wild cane, and giant reed, and A. donax is native to the Mediterranean Basin and the Middle East. Wikipedie says that plants generally grow to 6 metres high, with hollow stems 2 to 3 centimetres in diameter. The leaves are alternate, 30 to 60 centimetres long and 2 to 6 centimetres wide with a tapered tip, grey-green, and have a hairy tuft at the base. 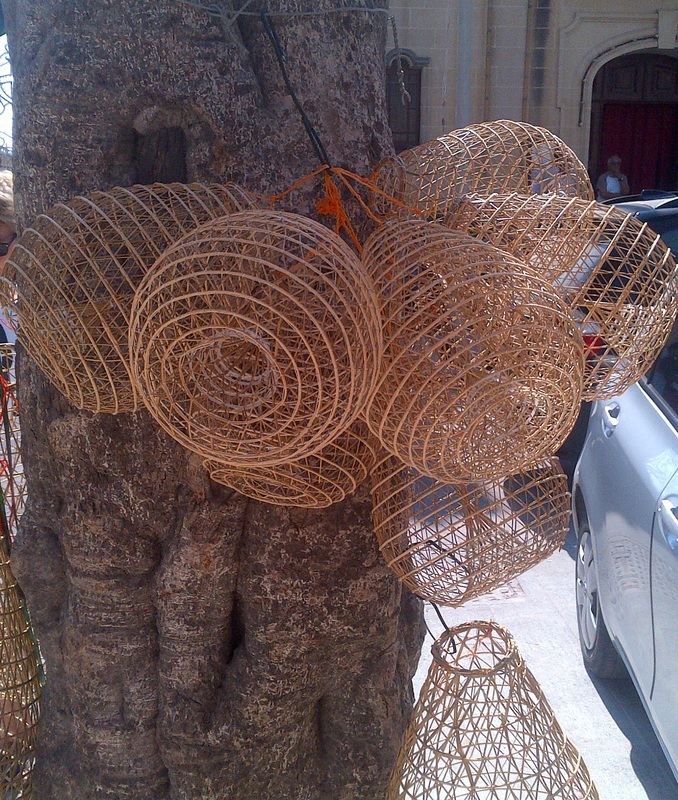 The canes in Gozo used to be the main raw material for fishing traps and lobster pots, but these are now often manufactured from plastic an imported from outside the country. Fortunately, there are still some fishing traps to be found, and I saw these for sale in the market on I-Tokk in Rabat, Gozo. The other use of the reeds is the manufacture of curtains that traditional houses have on the front door. 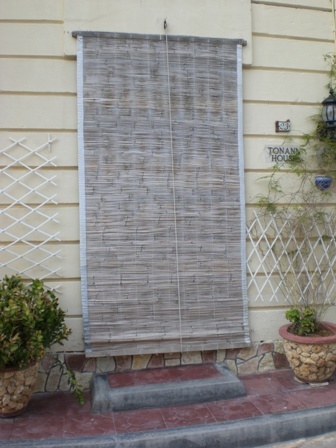 It provides privacy when the door is open during the hot summer days. We do this ourselves, as a breeze in the courtyard is very nice, but you do not want the house to be open to the elements and the casual passer-by. Many of the modern curtains come from the Far East, as it is often cheaper to buy imported mass-produced goods, than hand-made local produce, but fortunately there are still some local manufacturers on the island. My wife and I bought a custom-made curtain from a traditional manufacturer in Gharb, and he has no website or other means of advertising. We got to his house by talking to a lady in the street and asking where he lives. I forgot to take a picture, so will share a photo from the internet. 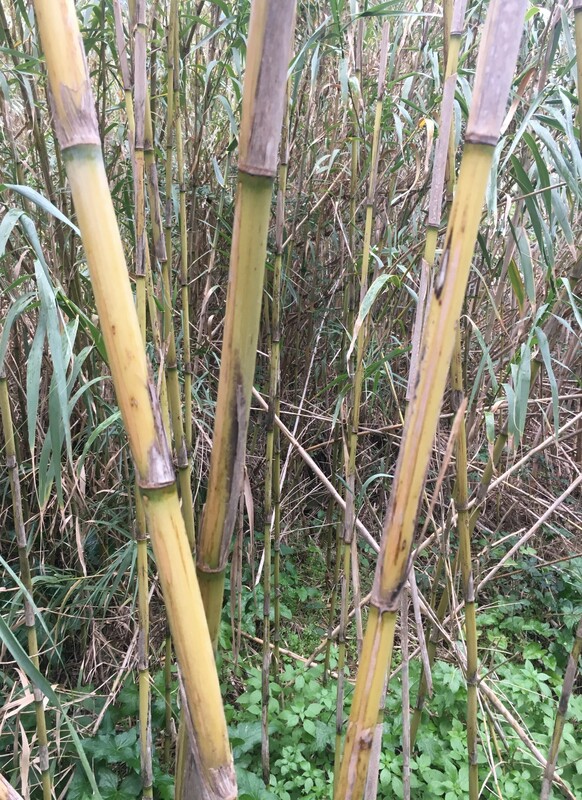 It was an interesting discovery to learn about the Gozo canes, and although they are not a bamboo species, I can relate to them. I was in Hangzhou, the capital of Zhejiang Province recently. Hangzhou District covers not only the central city but also a number of districts and many villages. I was told by our friends in the Hangzhou Forest Academy that this is the area with most of the Moso bamboo in China – 164,000 hectares! My main reason for my visit was to help award certificates to the ten “Most Beautiful Bamboo Villages” in Hangzhou. The competition had been organised by the Hangzhou Forest and Water Affairs Bureau, Hangzhou Culture, Radio and Television Group and Hangzhou Daily Group, in partnership with the International Network for Bamboo and Rattan -INBAR. The ceremony took place in the offices of the local TV station, and I was asked to say a few words on behalf of INBAR. It was touching to hear the emotional thank you speeches from some of the winners, and I was very happy to learn that the awards were not just decided by a panel of judges. The local people in Hangzhou had the opportunity to vote through social media, and they have been active supporters. Therefore, the lucky winners were recognized by their own peers, and this made it even more meaningful. One of the villages that received an award was Shi Lin, which is the smallest town in China, with only some 5000 participants. 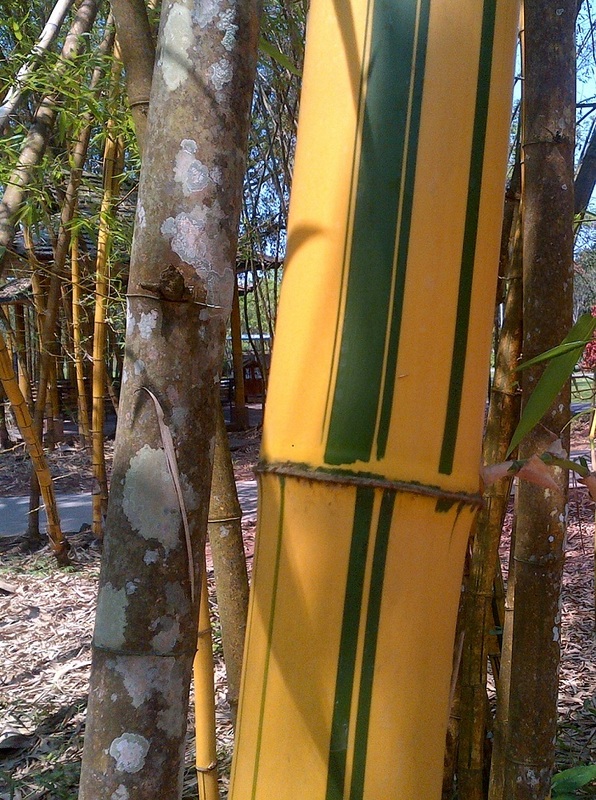 The town has large bamboo resources, and we visited one of the plantations to see the big Moso culms. The village leader told us that nearly half the population depends on bamboo for its livelihood, while eco-tourism is another main form of economic development. Interestingly, there were a number of bent bamboo culms in the Moso plantation that we visited and when I enquired how this happened, I was told that this was a result of heavy snow fall last winter. It is difficult to imagine snow when the temperature is around 35o Celcius, but the 2015/2016 winter has been severe in this part of China. Judging from the number of damaged bamboo culms, the weight of the snow must have been considerable. Therefore, I was intrigued to learn that there is a stone forest in Hangzhou, and I was very grateful for the opportunity to visit the site, which is called the Qiandao Lake Stone Forest. It is a most interesting geological and morphological phenomena, although much smaller than its namesake in Yunnan. There appears to be a relatively small limestone lens between other rocks, and the surface outcrop of this limestone bed has weathered into deep karst fissures. It is still relatively unknown to the public, and we were almost the only visitors. The limestone is eroded down to ten metres in some cases, creating narrow, deep trenches, and solution patters are obvious throughout. There rocks are badly weathered, and form all kinds of shapes, with the usual innovative names. There is a path that enables you to walk around, and this is tastefully constructed, without damage to any of the rocks, and without obvious concrete or other construction features. There is a cave in the area, which is a classic vadose stream passage of some ten, twelve metres high. You can traverse from the lower entrance where a stream emerges to the upper entrance, and a steep staircase allows you to climb out. I saw a good number of bats roosting on the ceiling, and there are a few Buddha statues in the lower entrance. I wonder if there are more such cave passages further along the cliff wall. Shilin village does not only qualify for one of the “Most Beautiful Bamboo Villages”, but it would also be a candidate for a beautiful karst village. I celebrated Christmas 2015 in Thailand. My wife and I visited good friends in Chiang Mai, and we subsequently spent some days further north in rural Thailand. It was a wonderful experience, with several visits to Thai temples, walks in the forest to waterfalls, a fabulous Christmas dinner in the Four Seasons Hotel in Chiang Mai, evening shopping in Chiang Rai night market, views over the mountains in Burma and the chance to eat many delicious meals. One of my overwhelming memories of the trip is the abundance of bamboo clumps throughout the area. Rungnapar Pattanavibool wrote in 1998 that there are 60 species of bamboos recorded in Thailand. Thai clumping bamboo forests are so different from the Chinese Phyllostachys forests that I have visited in China. The density of bamboo culms is much higher in clumps, and most of the clumps are part of a mixed forest canopy. My first encounter with bamboo during this trip was near a small temple Wat Pha Lat in Chiang Mai, not far from the zoo. After a steep walk we arrived at the temple complex, adjacent to a set of rapids in a small stream. There were several nice clumps of bamboo, but I am not sure of the species. After Christmas, we travelled north to Chiang Rai, where we stayed at “The Imperial”. This is a very pleasant hotel, with a nice garden on the bank of the Mae Ping. The island at the bottom of the hotel garden was full of green-and-yellow striped Bambusa vulgaris, and you could get from the bank to the island on a rickety bamboo bridge. It is not the image I would like to promote, as there is so much more you can do with bamboo, apart from building simple emergency bridges, but it makes a pretty picture. The following day we travelled further north and west, through the landscape of the Chan community. There is bamboo everywhere along the road, and the Chan people are using bamboo for daily life use. Small stalls along the road sell bamboo baskets, brooms and other tools. Later we also found bamboo ladders for sale along the road. We stopped at a local village and saw how bamboo is used for fencing, for all kind of household tools, and for construction. Traditionally, houses are constructed by using bamboo strips to make the walls, although it seems that the main structure is often made from timber. This combination of wood and bamboo is what makes buildings that can withstand earthquakes or other natural disasters. INBAR has a lot of good experience in this area, especially in Latin America. The houses we saw had very simple wall constructions. The bamboo is split and the pieces are used as a panel of bamboo strips. There does not appear to be any further enhancement. As I already stated, most of the bamboo in northern Thailand is part of the natural forest, and bamboo is mixed with timber tree species. In many cases you recognise the crown of bamboo trees from the distance, as they appear like plumes of feathery leaves. I assume there are different species, but is difficult to see from a distance. Although I had expected to see rattan as well, I did not notice any rattan in the forests that we travelled through. One day, Bryan suggested that we should visit a local waterfall, where there was natural bamboo forest. We found the place, and the bamboo: giant bamboo, or Dendrocalamus giganteus! The culms were up to 15cm thick, and 30 metres high or more. To say that these clumps looked “majestic” is an understatement! With all these bamboo resources, one might have expected a thriving bamboo industry in this part of Thailand, but that is not at all obvious. I saw lots of very simple uses, without much – if any – added value. The production value chains seem to stop at the most basic use of bamboo, mainly using the natural culm or slats that have been split from the culm by hand. There is no higher-value industrial use, despite the ample resources. Why are there no flooring companies, or pulp and paper mills, or modern furniture producers? This is an area which could be developed without too much effort. The “One Tambon One Product” philosophy could be a perfect way of promoting local bamboo development, but private investment may be needed to encourage some local communities to start production of high-value bamboo goods. Thailand has just indicated that it wants to join INBAR as a Member State, and this may be one catalyst to identify opportunities for development. I hope that we can work with the Royal Forest Department of Thailand to identify and properly map the main bamboo resources, and then to help determine the best options for local and industrial green development with bamboo. 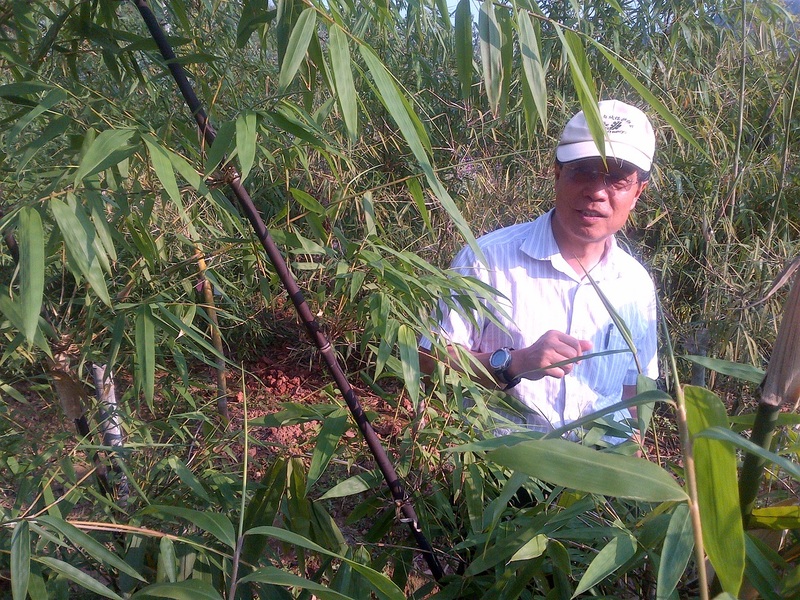 Are there really 276 Bamboo species in Yunnan? I visited Yunnan Province in southern China several times during the first years of this century, when I was helping the local authorities and the UNESCO National Committee of China with the nomination of the Stone Forest near Shilin as a natural World Heritage Area. Last weekend, I returned to Yunnan, but with a very different agenda, as I am now in charge of the International Network for Bamboo and Rattan (INBAR). 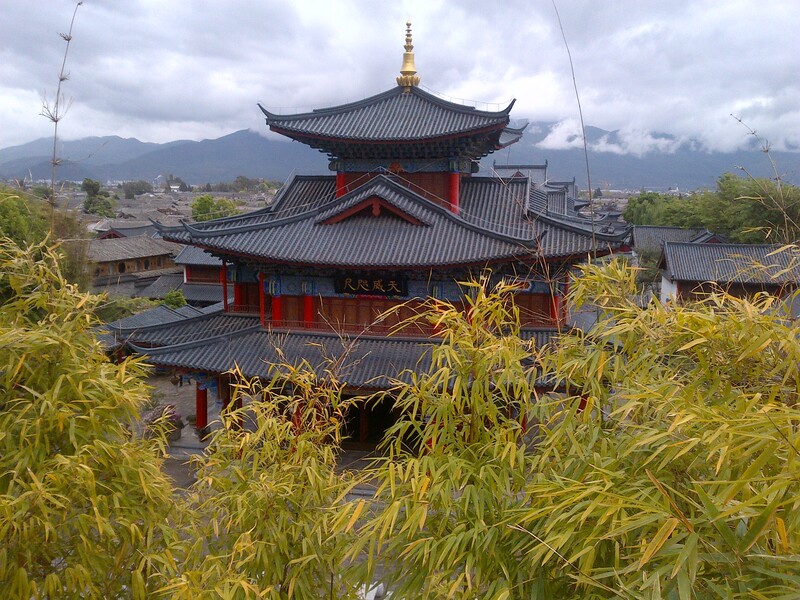 I had been told that Yunnan is very rich in bamboo species, and I wanted to see this with my own eyes. First my wife and I spend the weekend in the charming old town of Lijian, a cultural World Heritage Area. It is a beautiful town, and well worth the visit. One of the highlights of our stay was a visit to the Mu mansion, and I did see bamboo in the garden of the palace. But, the main objective of this trip was a visit to Xishuangbanna Tropical Botanical Garden-which is referred to as XTBG on signposts and posters. Professor Yang Yuming, President of the Yunnan Academy of Forestry, is about to publish a flora of bamboo species in Yunnan Province and the latest count is that the province houses 276 species of bamboo, which is more than half of the total of China’s bamboo diversity. 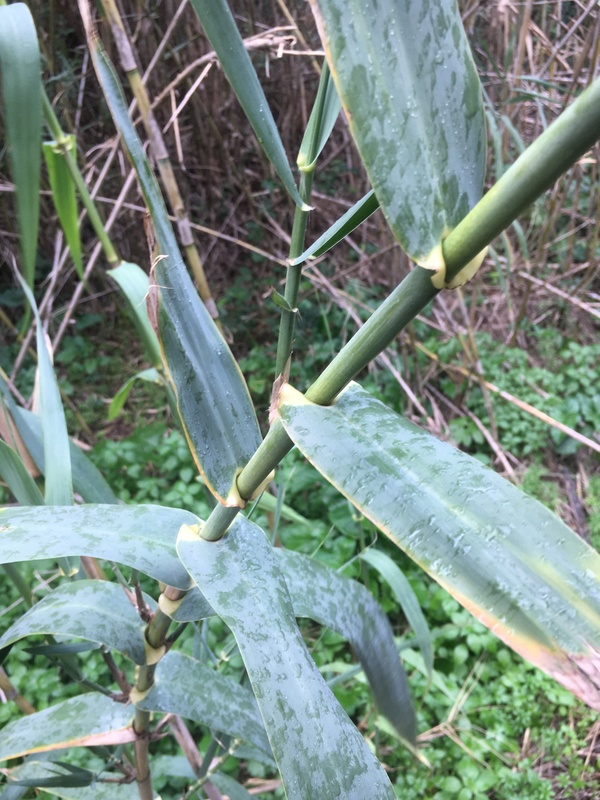 All of the bamboos in Yunnan are tropical bamboo species, and that means that they represent sympodial, clumping bamboos, where the culms grow from a central root mass. There is no wide spread of roots and rhizomes, which is the case with the temperate monopodial bamboo species, which we call running bamboos. There are more than 100 different bamboo species represented in XTBG, including the striking Bambusa vulgaris. A large number belong to the genera Dendrocalamus. Dendrocalamus yunnansis is only found in Yunnan, as the name suggests, and Dencrocalamus hamiltonii is only found in Xishuangbanna. Dendrocalamuus sinicus is one of the largest bamboos in the world, and can reach heights of more than 30metres. and Dendrocalamus giganteus is also a large species. 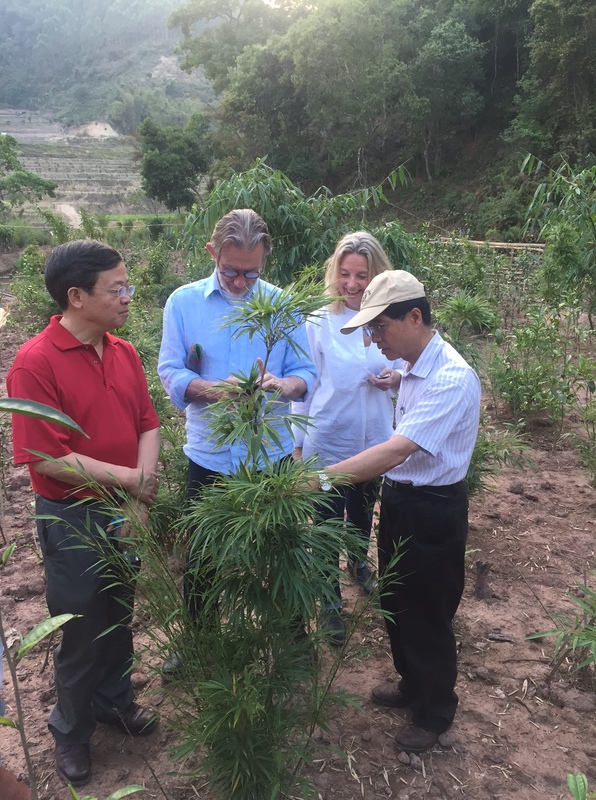 After our visit to the botanical garden we went to a forest research station of the Yunnan Academy of Forestry, which is focusing on finding opportunities for economic development of the forest, without the need to cut down the trees. The researchers are also testing alternatives to rubber trees. 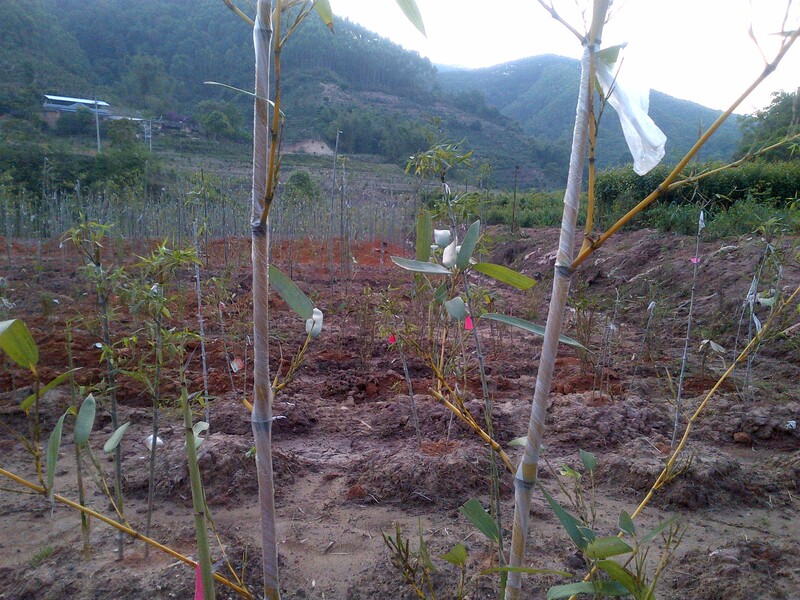 Large areas of Yunnan were transformed into rubber plantations in the sixties and seventies, but this is not good for biodiversity and ecosystem health. It is also no longer economically attractive, as the price of rubber has slumped and import of cheap rubber competes with local production. NTFP development, including bamboo planting and harvesting, is one of the many options that is being considered. The nurseries at the research station are very healthy, though currently stocked with hardwood seedlings, and not with bamboo plants. 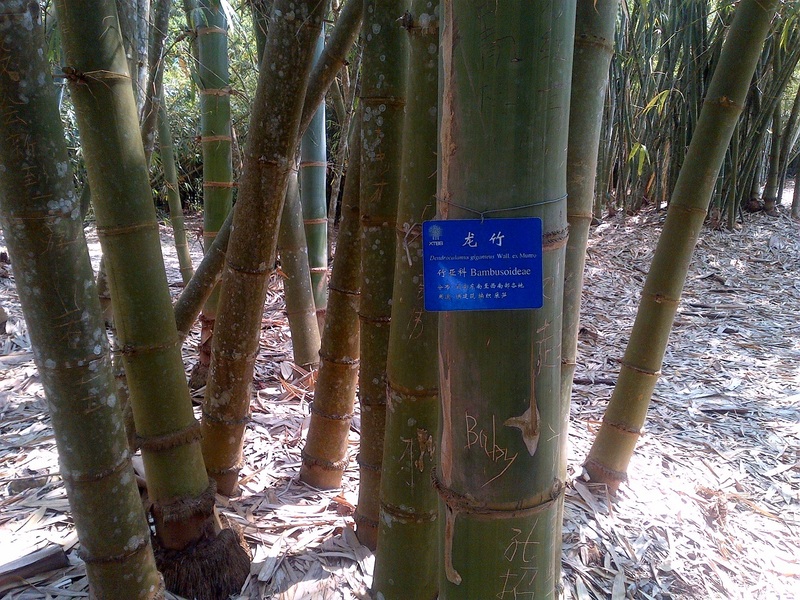 Our last visit was again focused on bamboo, and took us to a “bamboo introduction area” near Pu’er. The plan is for a 2000 hectares valley to be re-forested with different bamboo species. Currently, the upper slopes are covered in Eucalyptus and rubber trees, and the valley floor and lower slopes are non-productive agricultural land. A healthy bamboo forest would be a real asset, with significant ecotourism potential. Mr Zhang Xingbo, who is the driving force behind the initiative, explained that the garden will become a living museum, with information about the botanical aspects of bamboos, as well as details about their ecology and examples of the many uses. Eventually, the bamboo garden will also house restaurants where bamboo shoots can be eaten and bamboo beer can be drunk, and guesthouses built from bamboo with bamboo furniture and bamboo fittings. There may be outlets for bamboo handicrafts and nurseries that sell bamboo plants for the garden. It is a long-term development plan that would be daunting in many parts of the world, but the Yunnan colleagues are convinced they will get the work done in the next few years. 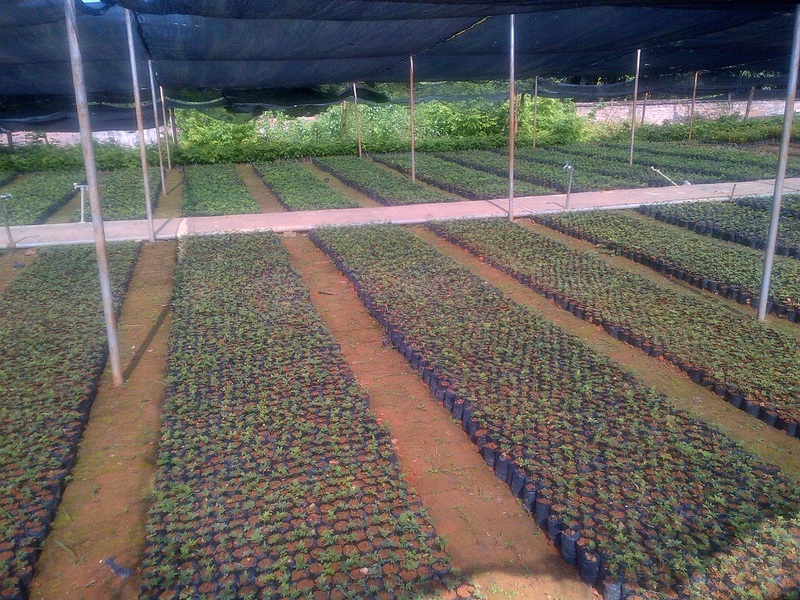 The first plants were planted last year, and it is real “work-in-progress”, but the new plants look healthy, and the current selection already represents a variety of species. There are some very interesting individual plants, such as a few species of Chimonocalamus, which is a genera tropical bamboos from Myanmar and Yunnan that are particularly rich in aromatic oil. The main stem and leaves could be exploited commercially for perfume industry or other purposes, but this is not yet happening. Folklore claims that the Japanese store tea in its culms, as it adds flavour to the leaves. Mr Zhang’s nurseries include other exciting bamboo plants, including the smallest bamboo plants that look like grass, and could be used for ground cover. 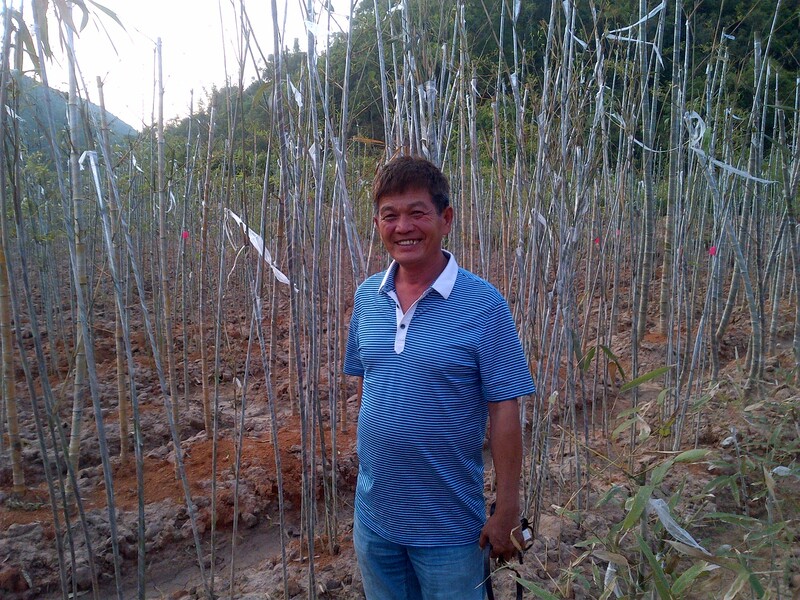 He also has saplings of red bamboo, and a healthy clump of recently discovered black bamboo from Vietnam. Professor Yang explained that the black bamboo is so unusual, that it does not yet have a scientific name. 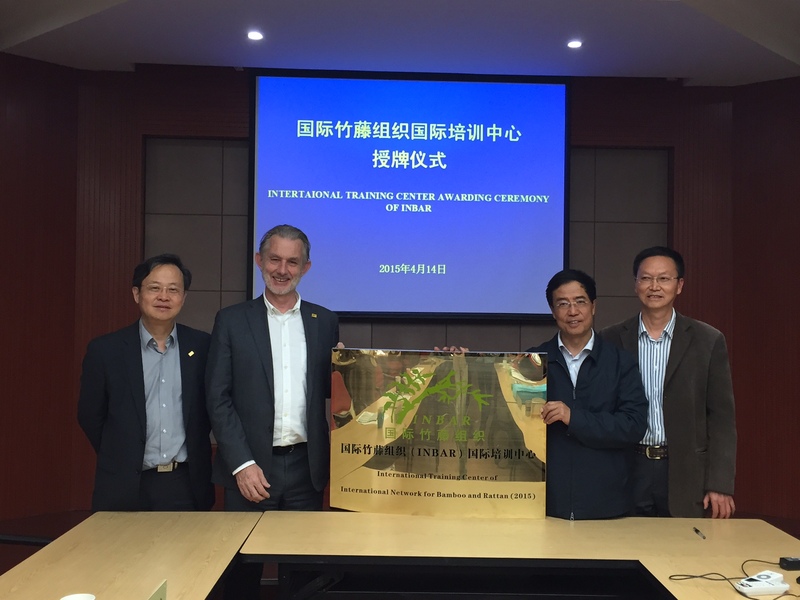 The following day was spent in Kunming where we visited the Provincial Forest Bureau, and signed an agreement to establish a training centre for tropical bamboo, in the Yunnan Academy of Forestry. ll-in-all, this was a very interesting learning experience. There is still a lot more to see in Yunnan, and I hope to return next year, not in the least to see the progress with the afforestation of the Pu’er bamboo garden.